One of the hallmarks of Modern painting has been the distinctive shift from the primacy of narrative towards an exploration of the medium of paint itself, so that a painting is concerned not only with its subject, but more profoundly with ideas about light, colour, space, shape and design. This is not to say that the artist is unmoved by, or disengaged with the subject, but simply that through exploring the abstract qualities mentioned above, a much deeper resonance is revealed. In the hands of a good painter, a landscape painting can evoke many mysteries, can be spiritual or earthy, intimate or expansive, triumphant or wistful. During this course we will consider the very different ways in which a subject can be treated, and how to express varied mood and feeling through the medium of paint. We will discuss the role of colour in communicating these themes, and the importance of subject selection and simplification in endeavouring to achieve an overall sense of unity and design. Students will be encouraged to develop a personal response to the landscape, and to find their own voice in expressing their ideas. The 5 day course in Dorset will be held at Milton Mill, near Bridport, a delightful country house with beautiful gardens, a river and pond, and views of the hilly countryside. 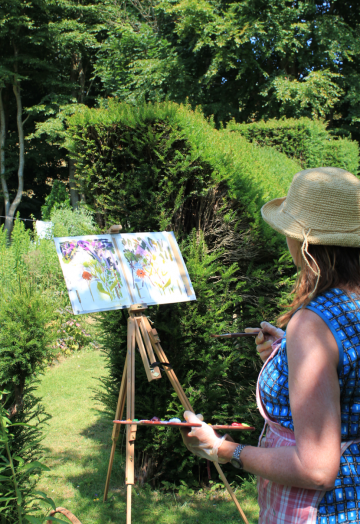 We will be focusing on painting out of doors in the Dorset landscape, both by the sea on the Jurassic coast, and in and around the gardens at Milton Mill. The course is non-residential, but will include lunch and refreshments every day. The house belongs to Hugo’s stepmother, and both the gardens and surrounding countryside have often been the subject of Hugo’s painting. To secure a place on the course a non-refundable deposit of 50% is required*, this can be paid through the button on the left of this page (you do not need a PayPal account to pay this way). If a bank transfer or cheque is preferable, please contact: assistant@hugogrenville.com for details. The remainder of the course fee is required four weeks prior to course commencement. Places on courses are limited so allocation will be made on a first come, first served basis .Studio Hugo Grenville reserves the right to cancel for whatever reason. In the event of cancellation you will be advised of vacancies on alternative courses. If you do not wish to book on an alternative course, a full refund will be given when Studio Hugo Grenville cancels. *In the event of cancellation by the student, we will endeavour to fill your place and if successful we will refund your deposit, if we are unable to fill your place the deposit will be non-refundable. Hugo Grenville is regarded as one of the country’s leading colourist painters, internationally recognised and represented by galleries in New York, Palm Beach, London and Amsterdam. Hugo’s work is grounded in the need to celebrate life, and to express our sense of existence through recognition of the transforming power of colour and light. He is also a revolutionary and inspiring teacher who has taught intermittently for 25 years, both from his studio, and at other institutions including Falmouth School of Art and the V&A Museum. His fabric designs were included in the Liberty’s Summer Collection 2011, and he writes occasionally for The Artist magazine.